The new Audi A7 Sportback is ready to show the world that dynamic design and immersive sound can meld seamlessly in a car. Featuring an organic fusion of state-of-the-art automotive technology and the superior audio innovation from HARMAN through Bang & Olufsen’s 3D Advanced Sound System, this stunning four-door coupe embodies progressiveness in design and sound, setting new standards for the luxury class. Representing the new Audi design language, the A7 is a sight to behold. Its exterior features large surfaces, sharp edges, and taut, athletic lines, while its interior evokes a futuristic lounge with horizontal lines and a sleek black panel instrument design for a feeling of airy spaciousness. Harmoniously integrated within this sophisticated cabin, the next-generation Bang & Olufsen 3D Advanced and Premium Sound Systems deliver fascinating 3D sound, with the Advanced System providing 3D sound not only for the driver seats, but for the rear seats as well. The 3D Advanced Sound System comes with 19 high-performance loudspeakers with a 19-channel, 1,820-watt Class D amplifier for a wonderfully realistic three-dimensional listening experience. The Bang & Olufsen 3D Advanced Sound System features Symphoria®, a revolutionary rendering solution for 3D surround sound reproduction developed by the Fraunhofer Institute for Integrated Circuits IIS, which works side-by-side with Bang & Olufsen’s multichannel matrix processing and Audi’s unparalleled elegance in a breakthrough collaboration to provide the best of three worlds. Regardless of their seat, passengers are treated to a natural, clear sound reproduction independent of source and music genre, creating the impression of a three-dimensional sound stage that increases perception of the height, depth and volume of reproduced music. Acoustic lenses placed on the dashboard reduce the need for a central listening location, while improved tweeter drivers lower distortion and enlarged woofers offer greater bass capability. Seeking to match the Audi A7’s sporty character without compromising on efficiency and power, HARMAN’s expert sound engineers spent more than 400 hours fine tuning and perfecting the Advanced Sound System for drivers and passengers alike. The woofers and subwoofer are equipped with an ICEpower amplifier to produce a total of 1,820 watts for punchy, dynamic bass and an exceptional overall sound experience. 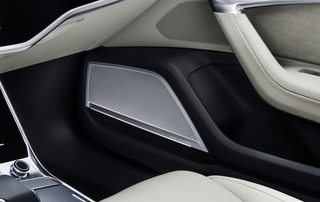 Additional loudspeakers further optimize sound for each seat, making the Audi A7 an ultimate ride as well as an ideal place to listen to music. 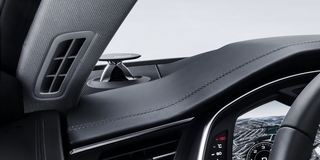 The Bang & Olufsen 3D Advanced Sound System in the Audi A7 also includes a Movie Mode, a new surround sound setting that enables passengers to enjoy true cinematic experiences from the comfort of their car, as well as three additional unique sound settings to let users customize their listening experience according to where they are sitting. On top, the sound system from HARMAN includes privacy features such as selected loudspeakers enclosed within their own sealed cabinets to keep interior sound where it belongs. Discover what happens when outstanding design meets outstanding sound in the new Audi A7 Sportback, available starting in early 2018.